"We've earned the 2017 Super Service Award from Angie’s List. The Award reflects consistent high levels of customer service. This is our third year in a row winning this award and we will continue to provide our customers with excellent communication and quality work. Read all of our reviews at AngiesList.com.” Learn more in our official press release below. "We've earned the 2016 Super Service Award from Angie’s List. The Award reflects consistent high levels of customer service. This is our second year in a row winning this award and we will continue to provide our customers with excellent communication and quality work. Read all of our reviews at AngiesList.com.” Learn more in our official press release below. “We earned the 2015 Super Service Award from Angie’s List. The Award reflects consistent high levels of customer service. Check our reviews at AngiesList.com.” Read more for the official press release. Can't pay for the landscaping project that you've always wanted with cash? No problem. 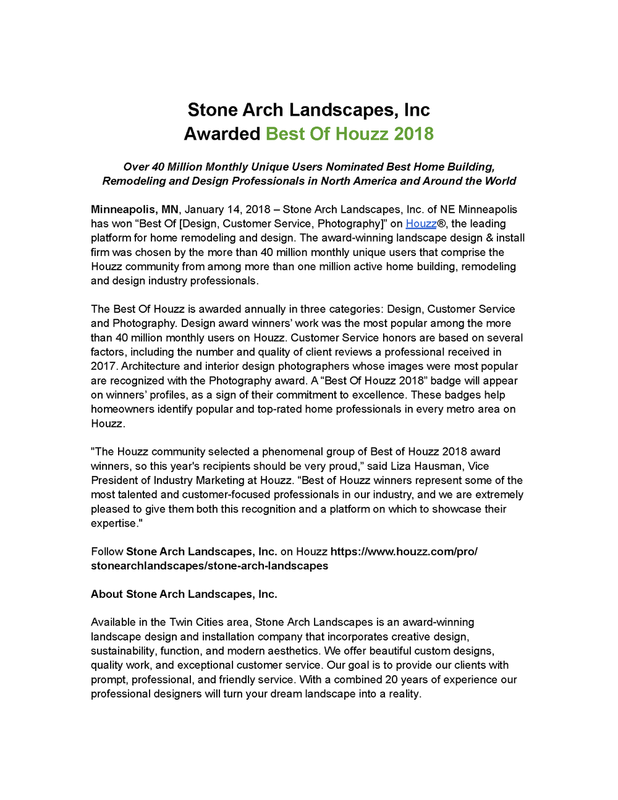 Stone Arch Landscapes now accepts Visa, Mastercard, American Express, and Discover so that you can personally finance the outdoor space of your dreams. Call us at 651-245-2472 for more information.